So, I had made it on Wipeout. I had a blast playing in the biggest playground imaginable. I even ended up on national television and had a permanent recording of me battling the Big Balls (and losing spectacularly). And when I say I didn’t have any regrets about losing, that’s the god’s honest truth. But that doesn’t mean I was 100% satisfied. I would have liked the chance to run the final Wipeout zone. Just once. Unfortunately, there’s no way to run the course unless you’re a contestant and they typically didn’t do “second chance” episodes. I guess it’d just have to remain a wish. Or would it? 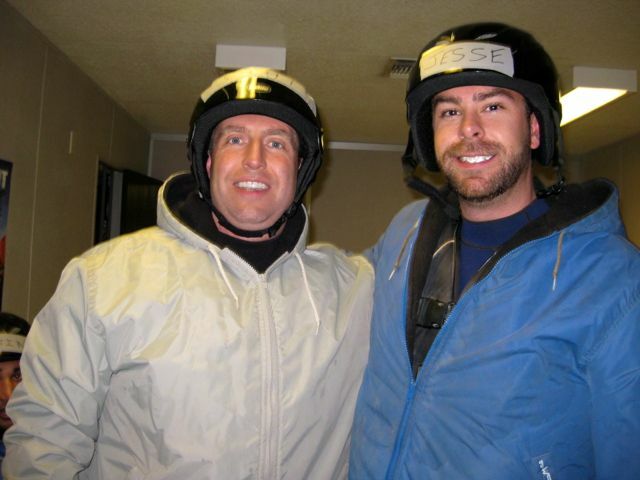 Not too long after my episode aired, I learned more about Wipeout’s “Black & Blue” Crew. These were individuals (some of them stunt people) whose job was to test and fine tune the Wipeout obstacles, making sure they’re ready for contestants. And on taping days, the B&B Crew were on hand to help supervise the contestants and provide safety measures. If you ran into trouble on an obstacle or got hurt, they were like Wipeout lifeguards who would act as first responders to jump in to assist you (along with the EMTs). I remember seeing these crew members when I was taping… and fortunately I wasn’t in need of their services, but it’s comforting to know they were there. 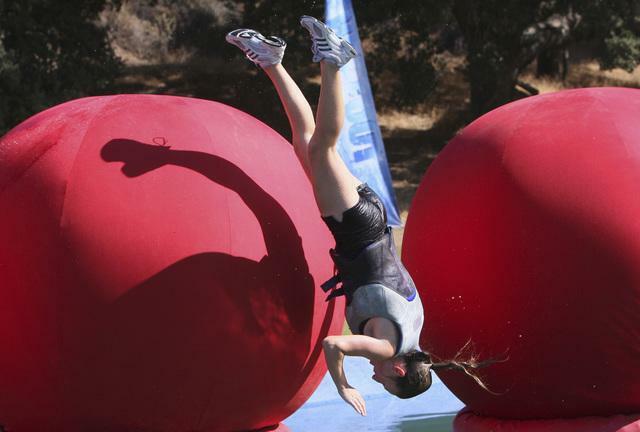 Anyway, I found out that in addition to the regular members of the Black & Blue Crew, Wipeout also brought in hand-picked B&B Crew volunteers to act as “test contestants” when they were fine-tuning the obstacles. 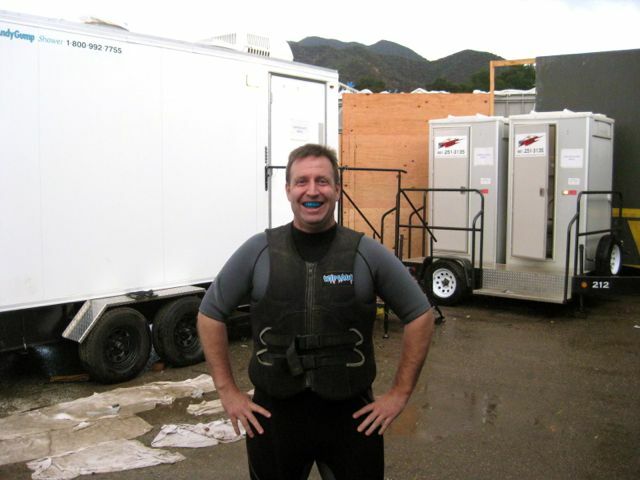 I discovered later that I was the first contestant in Wipeout history to ask to be a member of the Black & Blue Crew. So either I was seizing the opportunity or I just didn’t have the common sense to say “No mas” when it comes to self-abuse. Cut to the fall and I’m driving off to the Wipeout set with “Big Blue” riding shotgun (okay, so I didn’t really have my mouthguard sitting on my passenger seat, but it made for a good mental image). Arms Akimbo… by porta potties. The mood in the trailer was definitely different than when I was on the episode… gone was any apprehension about winning a prize or being eliminated. We were here purely for fun. Sure it was going to hurt like hell, but in a fun way. 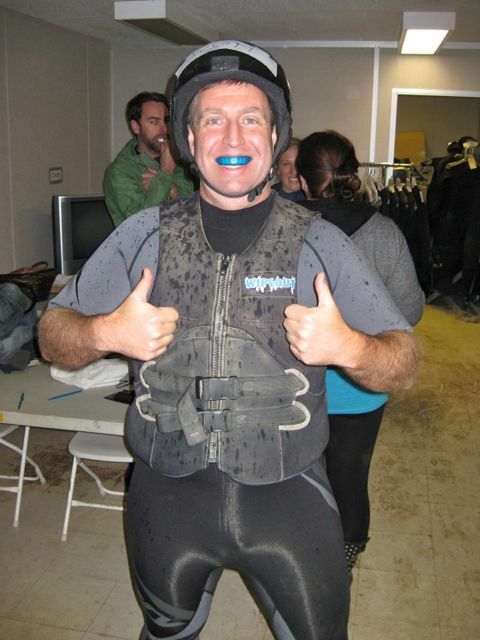 Myself and the other volunteers joked around as we were fitted with ankle braces, life vests, helmets and wetsuits (no epic shrinkage this day). Then we just had to wait for the sun to go down. Once darkness fell, we were led out to the final Wipeout Zone being told the whole way to keep our eyes closed (hands on the shoulder of the person in front of us, just like kindergarten). Finally, we were given the okay to look. What I saw in front of me made my inner 5-year-old giddy with excitement. An 8-story tall slide that curled upward at the end guaranteeing serious air time. And next to that what looked like a gigantic “plinko” board (and we’d be taking the place of the balls). There were two other obstacles in the zone, but I’d only be testing the first two instruments of torture. We weren’t sequestered as the other contestants went, we were just told to face away from the happy horror unfolding behind us. I listened as my new comrades in arms took their turns on the zone. Then it was time for Big Blue to ride again. One of the veteran members of the Black & Blue Crew led me up the stairs to the top of the slide. And up. And up. And up some more. I’m not a big fan of heights (or should I say landing at the bottom of ’em), but this was going to be fun… if I didn’t die. So, as I reached the tippy top of the 80-foot platform, they could see I was a little apprehensive about the extreme heights and asked me how I was doing. I looked down and saw the slide was covered in a clear lube… and thanks to a generous application with a brush, so was I. As I stood there feeling pretty much like a giant “Loogie” (aka booger) I asked what was in the lube. So much for getting Chinese food on the way home. I assumed my position on the very edge of the 80-foot slide/ramp and realized I was about to become a human snot rocket launched skyward. Cool. I whipped down the slide like a mucus missile and launched about 15 feet in air. I got cheers from the crew (who all stop to watch the volunteers) as I assumed the “can opener” position just before I hit the water. I can only assume that my two attempts at the giant plinko wheel were equally amusing as I slipped off of the pegs and fell 20 feet into the water, bouncing back and forth the whole way down. The horn sounded and I swam to the edge of the tank and (slowly) climbed out amidst clapping and cheers from the crew. And like that, Big Blue’s wild “second” ride was done. I got my chance at the final Wipeout Zone… very very cool indeed. I walked back to the trailer, stripped off my gear and put “Big Blue” back in his case (yes, I have one). After some quick goodbyes to my fellow crash test dummies and saying “Thanks” to the Wipeout production crew, I hopped in my car and drove home… smiling the whole way. I wondered if should stop and pick up some Chinese food. Big Balls 2.0… and Run on! Posted on April 16, 2014, in General, Humor and tagged BIg Blue, Wipeout. Bookmark the permalink. 3 Comments. Thanks… it was a pretty fun sandbox to play in. And I looked fairly ridiculous, so win/win.